All models of iPhone, iPod and iPad supported. Compatible with all iOS versions including iOS 12. TouchCopy is the only software you need on Windows or Mac to copy Music, Messages and more from your iPhone to your computer. 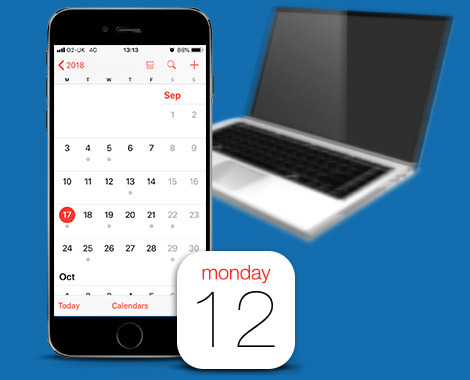 Use TouchCopy to view and copy all the calendars on your iOS device (iPhone, iPad or iPod Touch) to your computer. Simply select the calendars you wish to copy and click on the "Copy as vCard" (PC) or "Copy to Mac" button in TouchCopy. With TouchCopy you can backup calendars to your PC as vCard (.vcs) formatted files. You can then import your iPhone Calendars to Microsoft Outlook. 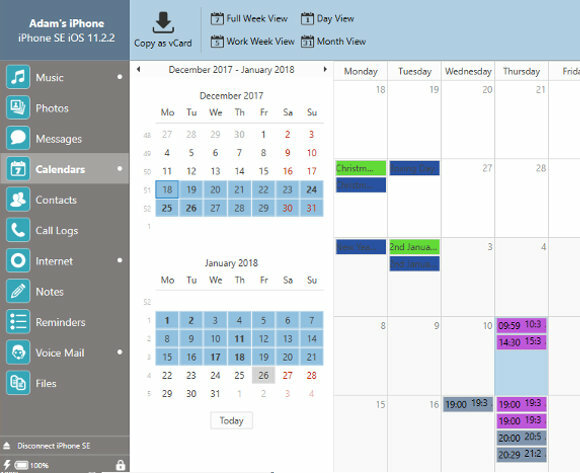 On the Mac, you can save calendars as iCalendar (.ics) files, or copy your iPhone Calendars directly into iCalendar from TouchCopy. Once you've saved your iPhone calendars to your usual calendar manager with TouchCopy, use iTunes to sync these files to your new iPhone or another iOS device. Connect your new iPhone to your computer, open iTunes and choose your device under DEVICES in iTunes. Click on the Info tab in iTunes and check "Sync Calendars", and click on the "Sync" button in iTunes.